The passenger aeroplane at Capernwray quarry in Lancashire lit by five remote strobes. The passenger aeroplane at Capernwray quarry in Lancashire. A total of five remote strobes have been used to light the scene. Triggering is by strobes linked with fibre optic cables. 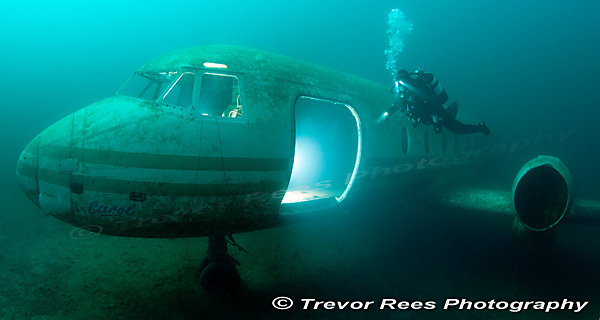 Diver Rob Bailey swims in to the frame where the light from the fuselage door catches his mask. - voted the winning image at BUPG's December meeting.